Wow James, a prodigious amount of work. I just read Egan’s Wang’s Carpet and was wondering how one would describe the two branches of humanity he described. I realize they would probably be Transhumanists. I am very tempted to get O’Connell’s book and use your links to follow along. Thanks for all your work I really appreciate the lists and things you share with us. Many science fiction stories deal with transhumanistic concepts without using the label. I’m not positive, but the transhumanists might have gotten their ideas from science fiction first. I read a bit on one of your links and the Wikipedia page, and their ideas most definitely did originate from science fiction.I’ve never taken science fiction, as I assume you haven’t, that literally or so narrowly.I have taken it very seriously yes, as a creative form of writing that pushes the boundaries of modern fiction, but that has been under-appreciated it seems by these people who merely want to treat its themes as an actuality.It seems a shame that they have no eye for the written genre’s finer points as a literary art form, and seem to view it so cynically. It doesn’t matter if I have any viewpoints regarding spiritual or metaphysical matters and find them interesting within the context of speculative fiction, but the actual cultivating of them into the tangible matter they seem to want to make it is limiting and dangerous. I wonder if the popular Professor Jameson stories by Neil R. Jones might be the “patient zero” of transhumanism? Those date back to 1931, but Jones was actually not the first author to use either suspended animation or brain transfer to robot bodies. That’s a fantastic idea. I was thinking Frankenstein’s monster was patient zero, but Professor Jameson is a lot more exact. I love the connection to Professor Jameson and I have been happily reading the linked article you provided. I think I will have to look at the books again and see what else I can find. The basic question is whether Death is part of the human experience or is Death a problem to be solved. Personally, I believe death is inevitable. We may extend life some, but everything in this reality comes to an end except reality. I must have read one or two of the Jameson stories too long ago to remember details, but I dimly recall them as pretty pulpy. The idea of flitting around the universe as an intellectual tourist caught my imagination, but I must have been young enough not to appreciate what doing without the “pleasures of the flesh” might be like. 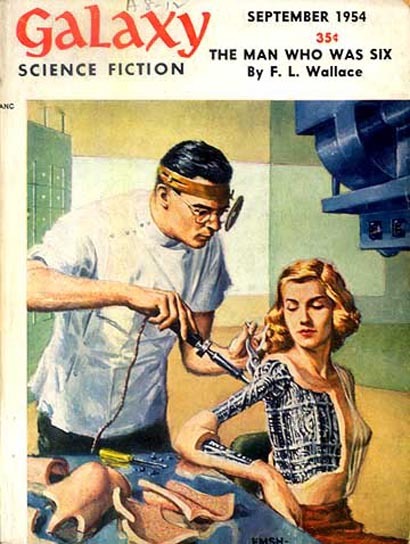 Another “transhuman” story I found memorable was C. L. Moore’s “No Woman Born” (December 1944 Astounding) about a badly burned dancer who is given a robot body that is humanoid, but not android. I first read it in one of the brilliant Ballantine/del Rey “Best of” collections (The Best of C. L. Moore – 1975). I liked this cover so much I posted it to Space Opera Pulp. Yep. Evocative and does right by the story, too. Another favourite illustration is the Frank Kelly Freas piece for Shambleau, Moore’s first published story and still one of her best. What an odd coincidence. I recently posted this cover to Space Opera Pulp on Facebook. It’s a fun group of people who love science fiction cover art, and recently passed the 10,000 member mark. Pretty racy for a fifties cover, don’t you think? I wondered if a young person looking at the reflector the doctor is wearing might assume it’s some kind of futuristic gear invented by the artist. Went to Facebook and had a look — boy, you could lose hours there. Great site. I always feel bittersweet looking at such collections of art, though. Don’t know if it’s frustration at all the stuff I never read, or just missing the excitement of youth and more optimistic times. I do know that if I were to read these stories now it wouldn’t be the same. Part of it is also a longing to escape into these fantasy worlds, but then looking at non-genre art often affects me the same way. Basically melancholy brought on by the limits of mortality I guess.